The work of Mark Engebretson, Augsburg College physics professor, will strengthen research conducted during the NASA Radiation Belt Storm Probes (RBSP) mission that launched Aug. 30 from Cape Canaveral Air Force Station in Florida. Engebretson on Aug. 21 presented at a pre-launch meeting for NASA officials and RBSP science team members near the Kennedy Space Center in Florida. He explained how his observations from National Science Foundation (NSF) grant-funded research at Augsburg College can serve the mission's objectives. The RBSP project is budgeted at $686 million, a sum that incorporates the mission's planning phase, construction, launch, satellite operation, and scientific analysis. NASA during the mission launch used an Atlas rocket to send two spacecraft—or twin probes—into the invisible donut-shaped Van Allen Radiation Belts that surround the Earth's equator like Saturn's rings surround that planet. The mission probes will take simultaneous readings at different locations far above the Earth's atmosphere to determine whether a change in radiation levels indicates a change across time or across space. Augsburg College since 1970 has supported research that examines the Earth's space environment. Ground data that Augsburg instruments collect will provide a large-scale picture of what is happening in the Earth's environment, which is key as it takes each satellite approximately 10 hours to travel in one orbit, according to Engebretson. "That means they miss most of the volume of space," he said. "We need the spacecraft to look in detail right in the middle of things, but we can see other features from the ground." Engebretson was one of eight scientists from the United States, Canada, and Japan who were invited to the NASA meeting to describe how their organizations' ground-based research contributed to the scientific work of the RBSP mission. "There are very practical reasons that we're doing this research," Engebretson said. "Our society is now so highly technological that space weather affects us." Contemporary society relies on electricity for nearly every aspect of daily life and "magnetic storms [in the Earth's space environment] have temporarily knocked out huge areas of the electrical power grid," according to Engebretson. He believes that his research can help create a magnetic storm warning system that would operate in much the same way as hurricane and tornado warnings issued by the National Weather Service. "There are many fewer people hurt now because of weather warning systems," he said. In the same way, "we will still have some damage to our technological infrastructure because of space weather, but the research we're doing to help us understand it will reduce that risk and the damage that comes with it." Engebretson for more than 30 years has conducted space physics research at the College and has gathered data using ground-based observatories located at high latitudes in Arctic Canada, in Scandinavia, and in the Antarctic. "His knowledge of waves in the magnetosphere will be critical for the mission," said Engebretson's colleague David Murr, associate professor of physics. Augsburg College owns and manages experimental instruments, known as magnetometers, that measure magnetic fields. The Van Allen Radiation Belts are filled with trillions of charged particles that have been trapped by the Earth's magnetic field. The belts were discovered in 1958 but remain largely unexplained, which is why scientists are exploring the belts' harsh, dynamic environment and the extremes of space weather. NSF provided Augsburg with funds for the magnetometer instruments, and it continues to award to the College grants that cover maintenance and data collection costs. This summer NSF awarded $243,200 to Engebretson and Augsburg visiting faculty member Viacheslav Pilipenko so that the College can continue supporting collaborative research on magnetosphere interactions. The NSF has awarded Engebretson more than $1.8 million since mid-2008. 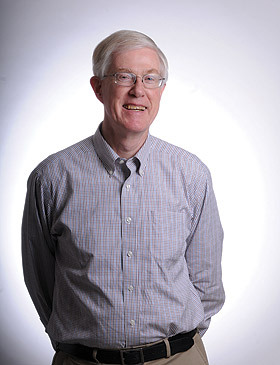 In addition to conducting research, Engebretson reviews academic journal articles through which his peers share conclusions from their experiments. The American Geophysical Union this fall will recognize Engebretson with an Excellence in Refereeing Award for his outstanding contribution in assisting editors select journal articles for publication. This is the second time that Engebretson will be recognized with the award; he also received it in 1990. While Engebretson said he appreciates the opportunity to join a world-wide community of scientists through space science research, he acknowledges that one of the most important features of his work is sharing it with his students. Engebretson's research grants from NASA and NSF have supported dozens of undergraduate student research opportunities that educate and motivate science students, he said. Student researchers often publish or present their own space science research findings and many Augsburg alumni continue their studies by attending graduate or professional school.